Beans are an important staple crop to grow along with corn, squash and potatoes. Devote most of your gardening time to learn how to grow these staples consistently. Fortunately, they are among the easiest plants to grow, store and propagate thanks to their large seeds or tubers and their fast-growing natures. Part of the difficulty is learning to plant, grow and harvest these crops in sufficient quantity to provide food for you all year. Beans are especially important because of their role in crop rotation. Beans, peas and other legumes foster nitrogen-producing bacteria that add nitrogen into the soil. If your garden space is limited, consider growing pole beans or climbing beans on other plants, such as corn stalks. Just plant the beans on the sunny side of the corn plants when the corn is already 6 inches high. Some people even grow squash in the same area in what they call the “three sisters” planting, where groups of the three are planted every 4 or 5 feet in mounds. The nitrogen from the beans isn’t released into the soil until after the beans have died, and the roots decompose, so the corn might need some manure or compost early on. Vine beans don’t produce well if fertilized with nitrogen (they produce too many leaves), but bush beans with pale yellow leaves that seem struggling might need a little nitrogen in the form of fish emulsion. How many bean plants are enough? 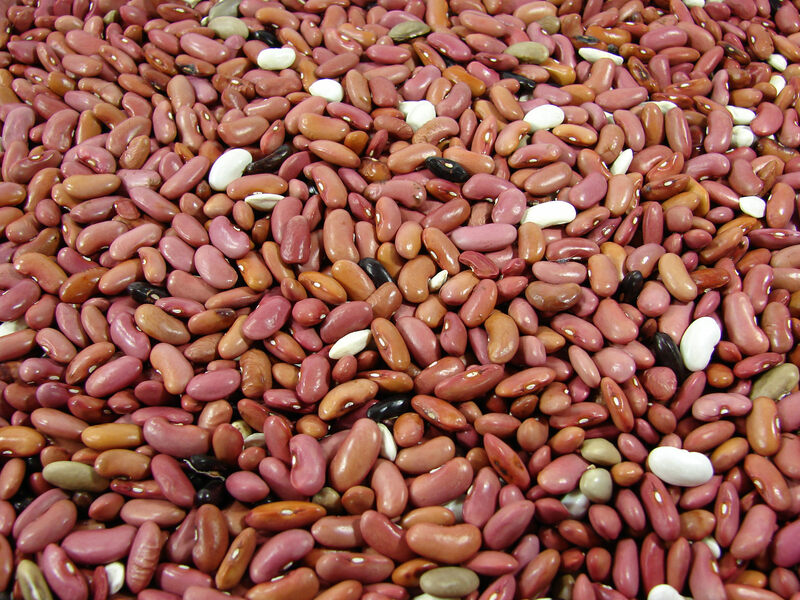 In hard times animal protein will be scarce and expensive, so beans will be needed to add protein to more of our meals. I still only expect to need about a ½ cup of cooked beans (1 serving) per person per day. That translates to 60 pounds or a 5-gallon bucket of beans per year for each adult. The OSU extension service says 100 ft of dry beans will produce 20 to 25 lbs of dry beans which means you need 250 to 300 feet of beans per person per year. Almost all bean varieties can be picked young as green beans, but the pods on typical dry bean varieties quickly become too tough to eat fresh. How much garden space is needed? Bush beans can be planted every 6 to 8 inches but climbing vine beans are spaced wider at every 10 inches. It turns out the land needed for both types of beans is approximately the same because climbing beans produce more per plant. Commercially grown dry beans in Idaho are planted in rows 24″ apart, but a grower in the dry part of Oregon produces much more by planting 44″ wide beds with three rows 1 ft apart. Some dry beans are also tasty if harvested early as green snap beans. In this case, plant them 2ft apart so you can pick both sides of the bean plants, but dry beans are only picked at the end as you pull up the whole plant, so a closer planting works well. What variety of beans should you plant? Beans are self-pollinating so you can easily plant any dry bean seed and get the same variety again. In fact, if you have old, hard beans in your food storage that don’t cook up well, just sow them into the ground. Many of them will sprout and produce a new, fresh crop for you. You can even save seeds from multiple varieties in the same garden and they won’t cross with each other as long as they aren’t planted side-by-side. I recommend Tepary beans for their drought tolerance even in hot, dry climates. Their seeds are small, but prolific and they handle the alkaline soils of the West very well. The Cherokee “Trail of Tears” bean is a good variety of small black beans that can be harvested early as a tasty snap bean and later as a small black bean, but it is a pole bean and needs a trellis, cornstalk or sunflower to grow up for best results. Mother Earth News has a good summary of other heirloom bean varieties with tips on how to grow them, but I would first just try the dry beans in your food storage that you already like using. They should stay true-to-type even if they aren’t an heirloom variety. This can be challenging on a big scale without a combine. The best advice on harvesting came from the small farm in Eastern Oregon mentioned above. They stop watering their ½ acre bean field a month before harvest to encourage it to dry out and finish off. Before the fall rains hit, they pull up the plants in the morning when a little dew keeps them flexible. They carefully remove any dirt clods that might get mixed with the beans and be hard to separate later, and then they gather the plants on the biggest tarp they can find (at least 20 ft x 60 ft). After allowing them a few days to finish drying, they thresh the dry plants by simply driving over them with a vehicle until all the pods are broken up. Some people with smaller quantities just thresh by walking or dancing to break open the dry pods while others pound them with sticks. Next is sifting and “scalping” away the dry plant material and the final step is to winnow or drop the beans in front of a strong fan to blow away the last, fine particles until only the dry bean seeds remain.